This is my second post in the series because I love making quilts for others, especially charities. But I certainly don’t want anything difficult, large, or time consuming--or the quilt would never get done! It has 20 plus quilt patterns and stories about quilts and giving. Project Linus http://www.projectlinus.org/ is a wonderful organization and will take many types of quilts, baby blankets and more. 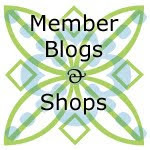 They don’t have strict restrictions regarding fabric type, quilt size, thread type, quilting method, etc. 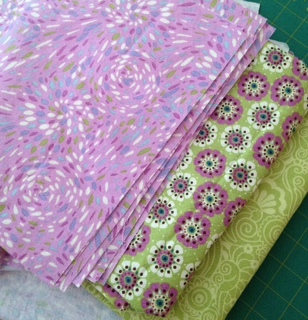 And, that is one reason I love making quilts for them. They also take knitted and crocheted blankets too. So if you are also a knitter like me or a “muilti-crafter” you can make lots of blankets for them! 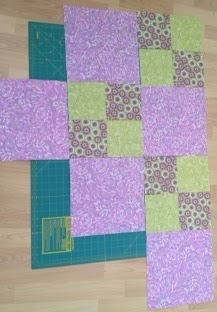 One of my favorite types of quilts to make is a 4-patch. I find them quick, easy and fun. 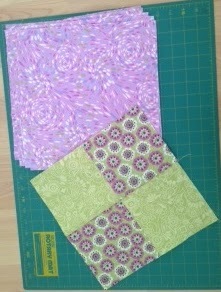 This type of pattern also lets me use scraps and just play. I am making the pattern in the book “All Patched Up.” The finished size is 44” x 55.” Three fabrics are needed: a large scale print, a small scale print, and a tone-on-tone solid. 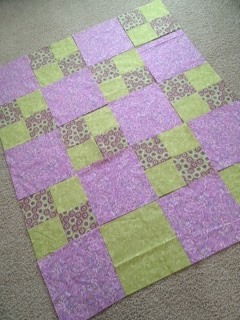 I better continue so I can make this quilt before our next guild meeting!